Admitted to Kowloon Docks for repairs to stern and engine. Completed on 15 Aug 1944 and discharged. 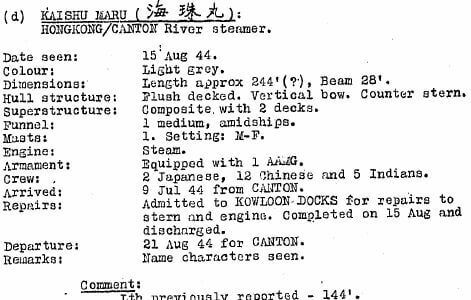 Stephen Davies adds: The only Kaishu Maru and Kaisho Maru that I know were both Imperial Japanese Army transports and ex-general cargo ships.